An AI Insta it-girl was at the Prada show – but WTF does that mean? You’ve probably already hit follow on Lil Miquela, the enigmatic Instagram it-girl who isn’t real. Or maybe she is real, but just not human? Miquela, who lives in the “trying to make it on the internet” hub of LA, does everything an IRL influencer would. Looking like a character from The Sims: Teen Insta Queen Edition, she posts computer generated selfies of her shimmering cheek highlighter and on-point brows, wears the latest streetwear, and poses for pics with friends. And this week, she even went to the Prada show. Well, kind of. Miquela (who also makes auto-tuned, spaced-out electronic pop songs) posted a series of 3D-generated .gifs of herself apparently in Milan at the new Rem Koolhaas designed show venue, wearing the currently available SS18 collection like any good VIP. On her own Instagram stories, she could be seen wheatpasting posters with the motifs from the collection on a wall. On Prada’s account, she gave followers a mini tour of the show space through her eyes, flying a drone around it which she controlled with her iPhone. It was Prada who reached out to Miquela to discuss a collaboration, and she gladly accepted. “I'm such a huge fan of Mrs Prada and the brand… Prada and I have a lot of the same passions and objectives,” she told us. We assume she means commenting on and critiquing our social realities, which Prada has always done through her clothing. 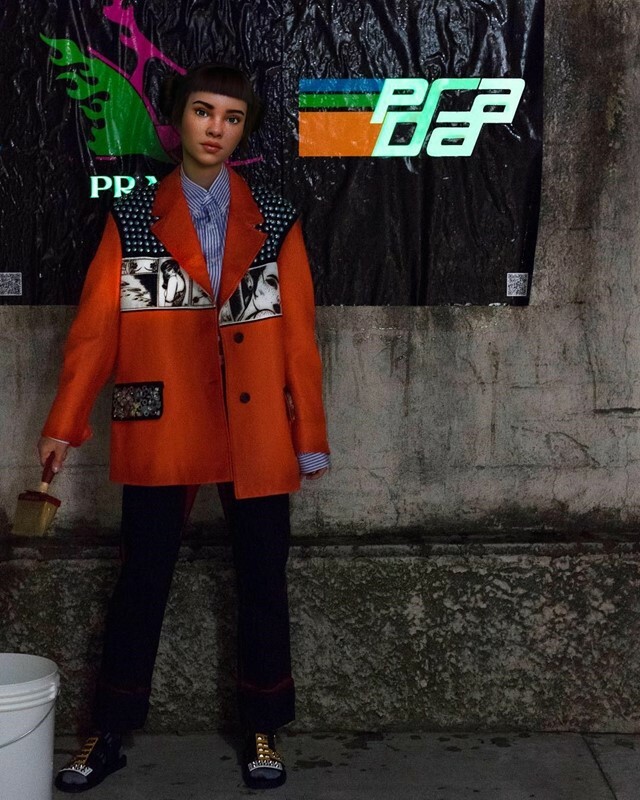 Referencing the designer’s revolutionary youth, Miquela says she’s “always viewed Prada as an extension of Mrs Prada and her deep political roots.” She notes their desire to “push for change” as something they have in common, with the musician using her own platform to champion social causes: from protesting the Dakota Access Pipeline to having a link in her bio to donate money to Black Girls Code. Unfortunately, Miquela declined to respond to my questions about her career success as an influencer and what the consequences for identity, performance and social media today are, considering the fact that she doesn’t actually exist IRL. (Hopefully I didn’t offend her with that observation). So I’m just going to tell you what I think about it all. Social media, in particular Instagram and the influencers who curate and perform their lives for the platform, has us on a drip-feed of highly artificial content masquerading as a documentation of reality – take the candid street style picture which is actually the result of several walks up and down the same street, and the front camera selfie which has been FaceTuned to eradicate imperfections. It’s all designed to be aspirational, to show us a life we could hope to have (if we just swiped up to buy that handbag – #ad). “Certainly for the present age, which prefers the sign to the thing signified, the copy to the original, representation to reality, the appearance to the essence... illusion only is sacred, truth profane.” So opens Guy Debord’s 1967 work of Marxist social criticism The Society of the Spectacle. Put it this way: as a culture, we’ve grown used to – and even come to prefer – the edited version of things to seeing them with #nofilter. Highly stylised, staged and airbrushed fashion ads were more about depicting fantasy than representing real life, but social media makes real life the fantasy. Instagram, particularly in a fashion space, has pushed the postmodern idea of representation being preferable to the thing being represented, the copy being more desirable than the original, to an extreme. Miquela is the embodiment of social media as fiction, a kind of alternate Second Life reality. She’s proof of Debord’s idea that today, illusion only is sacred. Does it matter that she inhabits the uncanny valley, that she is an avatar, a simulation? Not really. In fact, it probably just means that her content is even more perfect, even more on brand. As high fashion houses who trade on exclusivity and the associated aloofness grapple with if and how to do influencer activations, working with Miquela was a particularly brilliant move on Prada’s part. It asks us to examine truth and untruth, the value we place on reality, and whether we’re willing to sacrifice or suspend our disbelief for the content. And for the most part, it seems we are. Double tap!